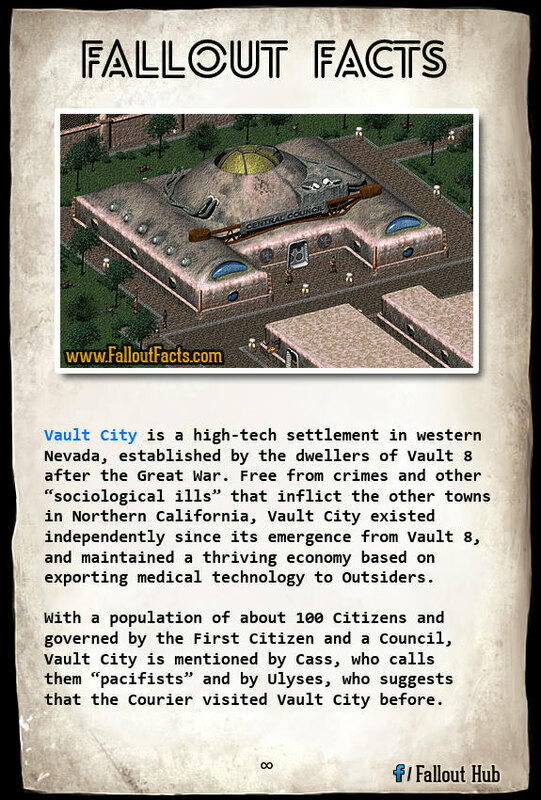 Vault City is a high-tech settlement in Nevada established by the residents of Vault 8. When Vault 8, one of the few so-called “control vaults” built by the Vault-Tec corporation opened after receiving the all-clear signal, its residents immediately set about the difficult task of rebuilding civilization with the technology that had been supplied to them. The existence of a Garden of Eden Creation Kit, or G.E.C.K., in the Vault, helped them in this task, as did the well-stocked armory and cutting-edge medical supply center. The residents used their functioning fusion reactor to provide power, and a few years after opening had built a thriving and bustling community, later known as Vault City. Records differ as to exactly when Vault 8 opened, but most accounts place the actual event somewhere between 2091 and 2122. By the time of the Chosen One in approximately 2241, the city population had reached 100 citizens, with an unknown number of servants and other residents. Vault City, despite being one of the few islands of civilization in the wastes, is not a democracy. The city is ruled by a Council, which is in turn led by a “First Citizen,” who control every aspect of life within Vault City. 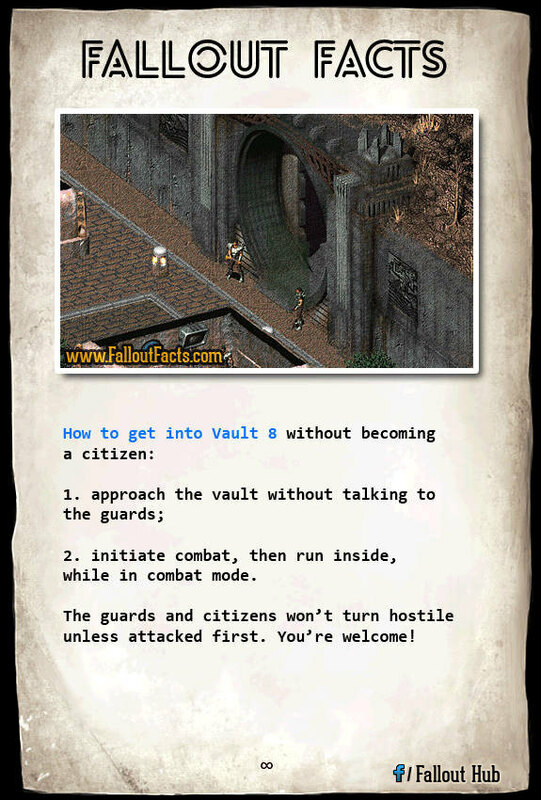 Local laws are strictly enforced, and even minor infractions such as bad-mouthing the First Citizen can land someone in jail for “reeducation.” All the usual vices most wastelanders take for granted, such as drinking, drug use, prostitution, or gambling, are forbidden in Vault City. Non-citizens, who are almost all servants, are actually forbidden to look upon the city lest they contaminate it with their impure gaze, and must stare at the ground or face punishment. Vault City is divided into four regions, with varying levels of security and access. These are, from outside to in, the Courtyard, Downtown, Council and Vault 8 districts. The Courtyard is where “outsiders” settle. It's the sort of suburb you find in third world cities, a squalid, disorganized pit of humanity with little to offer its residents. Still, there are a few bars and shops there, so it's not all bad. The Downtown district is where Vault 8 citizens trade for supplies. Other merchants can also be found here, but only if they have a day pass from the Council. The Council district is the home of the Vault citizens. This is where important decisions are made, or at least decisions that benefit the Council itself. Outsiders are strictly forbidden from entering the Council, but they can apply to take a citizenship test, provided they have the skills to pass it. Vault 8 is unique among the vaults in that it is still completely intact. It provides the power needs for Vault City via its fusion reactor, though its capacity is limited. By now it should be clear that the image of Vault City as an island of civilization is but a thin veneer over an intensely xenophobic, insular and elitist dystopian society reminiscent more of pre-war Communist states than any American society. Non-citizens have no rights to speak of, but those who really want to can gain entrance to the city by becoming “servants.” This unofficially means they become slaves. Some note and object to this hypocrisy, pointing out Vault City's own avowed opposition to slavery. Day passes are available to merchants and other non-citizens with a valid reason for entering Vault City. These grant access to the city during daylight hours, but not Vault 8. The way anyone usually becomes a citizen is to be born to it, but there is a citizenship test available for non-citizens to take. Interestingly enough, this test is made deliberately so difficult as to be nearly impossible for anyone to pass, even those who were born to citizenship.